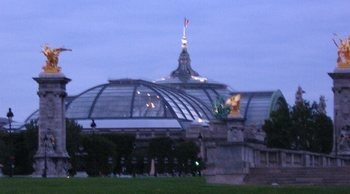 The Grand Palais, which has been recently restored, and statues on the Pont Alexandre III. Eiffel Tower at night, as seen from rue de l’Université. 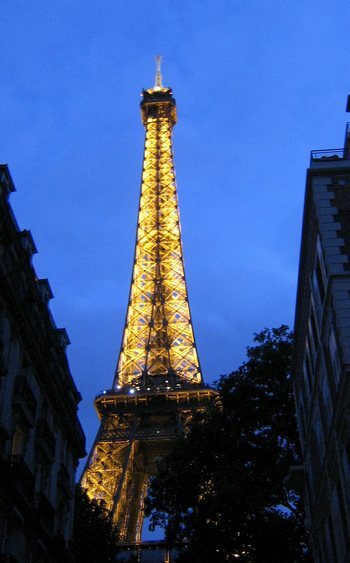 The Eiffel Tower glitters on the hour, for ten minutes, every evening. Yesterday we went on a very long walk along the Seine because it was Sunday, and cars were banished from the road along the left bank. To avoid all the traffic where the closed stretch finally ends, we took the pedestrian bridge at Solferino over to the Tuileries. After standing around in the shade for a few minutes, we were able to snag a park bench as soon as it was vacated by three young British tourists. We held onto this piece of coveted real estate until we were rested. The park was full of people. While Parisians are gone from Paris, it seems that all the tourists have now arrived in full force. Tom wanted then to walk to the Place Vendome, but when we reached the rue de Rivoli, he wanted to see if the English bookstore, Gagliani’s, was open. Of course it was not, but this gave us a walk down that bustling, busy commercial street that reminds me somehow of Venice. It was too busy and bustling to suit Tom, so we went North one block and re-visited the beautiful old Église Saint Roch (see July 30, 2001, for more about this church, and July 9, 2003, for amazing info about what Haussman did to the area around this church). What I didn’t know in 2001 and 2003 was that the famous French writer Corneille was associated with this church after he moved to Paris. He is buried in Saint Roch. There is a new set of panels that describe his life and accomplishments on display in the church. The saint for whom this church is named is, by the way, the one whose name is invoked to keep the plague away. We explored the market at Place du Marché Saint Honoré, which, we learned, is the site of the Jacobin’s monastery. (“Jacobin” is the Parisian name for Dominican, because the monastery was near the church of Saint Jacques was situated. The Jacobin Club was a radical republican group during the Revolution, and they met at the monastery.) The modern, glass upper stories of this market area cover a paved area where kids on small-wheeled bikes gather to show off their clever bike stunts. Finally, we reached the wide open Place Vendome. Footsore and thirsty, we went in search of the Nicolas café that is at 17 avenue de l’Opéra, but it was closed for Sunday. So we arranged ourselves instead at the Royal Café, at the corner of the avenue and rue des Pyramides. Tom wondered where the name Pyramides comes from in that part of Paris. It certainly pre-dates the Pyramid at the Louvre. I think the Place des Pyramides and the rue des Pyramides may be named after a battle that Napoleon Bonaparte won in Egypt in 1798. While sitting at the café, we noticed a tourism office across the street (Pyramides). It was open, and people were going in and out of it at a steady pace. So we decided to check it out. We collected some brochures about museums, etc., and stood around listening as one woman in particular helped a young American man to make hotel reservations. They actually do the booking of the reservations there in the tourism office. The woman was extraordinarily helpful to the young man, finding him a not-too-expensive hotel for the night and then recommending to him that he check back with her in the morning, because it is in the mornings that the hotels offer their better rates. By the afternoon, the rooms with better rates are gone. While the young man would have to pay about 80 euros for that first night, he will probably only have to pay about 60 euros a night after that (if he follows her advice). She spoke English slowly and clearly, enunciating each and every syllable. Tom saw her give a little book about Paris hotels to somebody. He wanted one, so he patiently waited. He was duly rewarded for his patience. She gave him a few little books – about restaurants, hotels, etc. – all for free. I haven’t had the chance yet to look these over, but I was very impressed with her generosity and spirit. What a great job – helping the weary travellers, and doing so cheerfully. We walked all the way back home, skirting through the elegant Place du Palais Bourbon once again. On the way, we made a reservation for dinner at La Gauloise, where the older waiter even knows our name now. 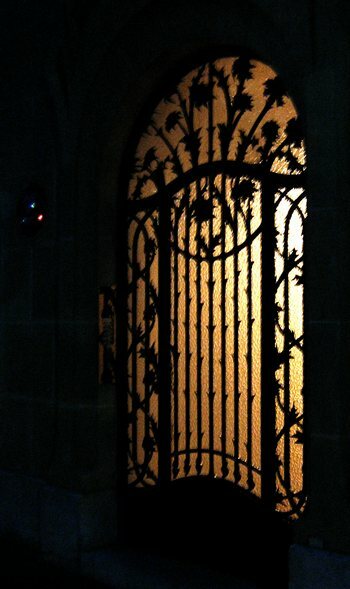 Door near the Champ de Mars at night.